In 2011, I wrote about Jugaad, according to Wikipedia “a colloquial Hindi word that can mean an innovative fix or a simple work-around”. I noted in the blog post that Jugaad is “now an acceptable management technique…and also applies to any kind of creative and out of the box thinking which maximizes resources for a company and its stakeholders”. Resource scarcity leads to innovation — as those of us who have lived and worked in the developing world are acutely aware. The ingenuity of a rural farmer in Africa is on par with some of the greatest innovation I’ve seen in the heart of Silicon Valley, particularly in light of the lack of “formal” training and mentorship many of us experience in the developed world. Since I wrote that post, millions more entrepreneurs have launched their businesses globally. Thanks to the Web and mobile connectivity, more and more people have access to online resources for education and information – the combination of on-the-ground expertise and this access to global information is creating a revolution. Unburdened by regulation and legacy infrastructure, these entrepreneurs are forging the future amongst a more decentralized, more level playing field. 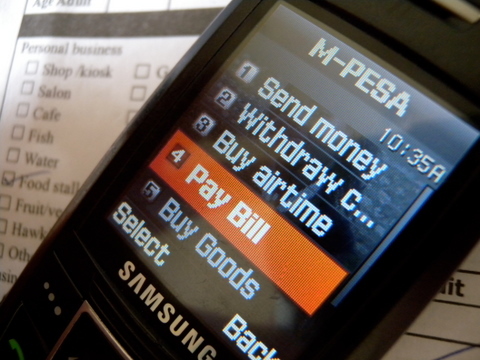 Mobile Money: Six years ago, mPesa launched in Kenya to transfer money via cellphone. A network of accessible agents throughout the country allows people to redeem money transferred to them. Kenyans now send money, buy groceries, pay bills and school tuition via cellphone — wirelessly transferring billions of dollars annually, over 40% of the country’s GDP. M-Pesa has inspired almost 200 similar efforts in other countries. In most of these countries, credit cards and traditional banking systems have not yet taken hold, making mobile money the only alternative to carrying cash (often in dangerous cities) and expending time to deliver cash. In more developed markets, entrenched financial infrastructure and a fragmented industry have made takeup of peer to peer mobile payments more challenging, although companies such as Venmo, Paypal and bank products such as Chase Quickpay have been gaining more traction as they’ve made the user experience better. Starbucks has also built successful retail mobile payment experience, albeit a closed loop one. The adoption of Bitcoin is creating a greater awareness of the fees that financial intermediaries charge, and a willingness amongst consumers to try solutions that create a more frictionless payment experience. Something Kenyans realized many years ago. Lending: In 1983, Muhammed Yunus founded Grameen Bank in Bangladesh, based on the notion that the poor were credit-worthy and that a model of positive “peer pressure” would lead to repayment of loans. While credit was relatively easy to obtain in the developed markets for much of the last 20 years, the 2008 economic crisis made it more difficult for even the middle class and small businesses to obtain loans. Coupled with the rise of technology and ability to access more data points beyond the traditional FICO credit score, new models of lending have emerged, some even utilizing the concept of social lending (via Facebook or other online groups) to create peer-to-peer lending platforms. Others, including OnDeck Capital, Lending Club and Kabbage, offer small businesseses small, shorter term loans, with less fees than traditional merchant advances and a streamlined approval process. The ethos behind microcredit has reached a market well beyond the poor, rural woman in an emerging market. Low cost medical devices: In 2009 in India, GE partnered with Wipro to launch low cost medical devices including a $500 portable ECG. Due to the success of its development efforts in this area, GE announced in 2013 that its three manufacturing facilities in Bangalore would start manufacturing an extended line of products, including ultrasound machines, ECG units, and maternal and infant care equipment, for markets in Africa, parts of Europe, Latin America, and Asia. These products are up to 40% cheaper than developed world solutions and is expected to address 10-15% of the global healthcare equipment market. While regulatory hurdles for devices are stringent in the US, the advent of wearables and mobile devices is likely to create more cost effective solutions in the developed markets too. Further, the prevalence of diabetes and cardiovascular disease in India has already created more cost effective monitoring solutions and drug manufacturing that will begin to address these increasingly widespread conditions in the rest of the world. Telemedicine: The United States and much of Europe has over 2 doctors/1000 people. That statistic drops to less than 0.1 doctor/1000 people in countries in the developing world. This scarcity, along with rural populations, has made health care delivery challenging. However, as mobile phones have increased, so have innovative models around health care, including telemedicine, mobile “dial a doctor” services and portable health clinics that can communicate with doctors in urban areas and the developed world. As health care has become more expensive in the United States, hospital emergency rooms are overcrowded, and more people are paying a la carte for services, we have seen an increase in similar business models in here, also enhanced by mobile connectivity. Local Delivery/”Last Mile”: This article documents the dabba wallahs of India – local delivery networks that deliver fresh meals through a complex hundred year old logistics network. In major US cities we are now seeing a plethora of on-demand delivery services, from Uber cars, to Postmates and WunWun for one-hour food delivery, to GoodEggs for local farm food, that have built out extensive local delivery networks – this time enabled by smartphones. The “last mile” of reaching consumers has traditionally been more challenging in more disconnected, less social countries – which is now being addressed by connecting these consumers via technology.